Can you imagine weaving for the king? That’s what Leki Wangmo has done for most of her life. I first met Leki, who is a Master Weaver for the King of Bhutan, and her daughter, Rinzin (a superb weaver herself) at Convergence 2006. It’s also where I first learned about Bhutanese backstrap weaving. At their booth at Convergence 2006, Rinzin was demonstrating the Bhutanese version of backstrap weaving. Mesmerized by her work, I settled down on the floor next to her and asked numerous questions. We’ve kept in touch ever since. 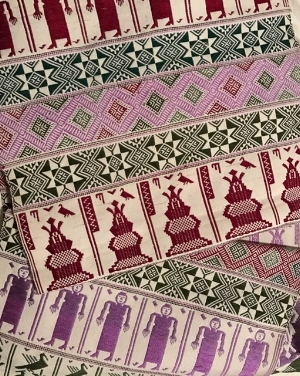 This type of weaving resonates strongly with me partly because of the technique and the aesthetic and partly because of my friendship with Rinzin and Leki, but I also love the fact that Bhutanese culture is still deeply imbued with textile traditions. Not only is traditional attire still expected at formal events, but it continues to be worn by many Bhutanese, of all walks of life, on a daily basis. In addition, during important religious and secular celebrations, guests are expected to follow the age-old Bhutanese custom of presenting the hosts with gift packages containing traditional textiles. During that first Convergence when I peppered Rinzin with questions, she demonstrated the packaging and presentation rituals, which include a specific way of folding the textiles for gift giving. Each package must include a khata (the Buddhist silk ceremonial scarf) as well as handwoven textiles of the quantity and quality dictated by the presenter’s affluence.